Susan Bernofsky is my favorite German to English translator of literature. Mind you, I can't name a lot of them if asked. But my usual experience of reading literature translated from German to English is to rush to the original German text out of disgust at a result I could easily better. 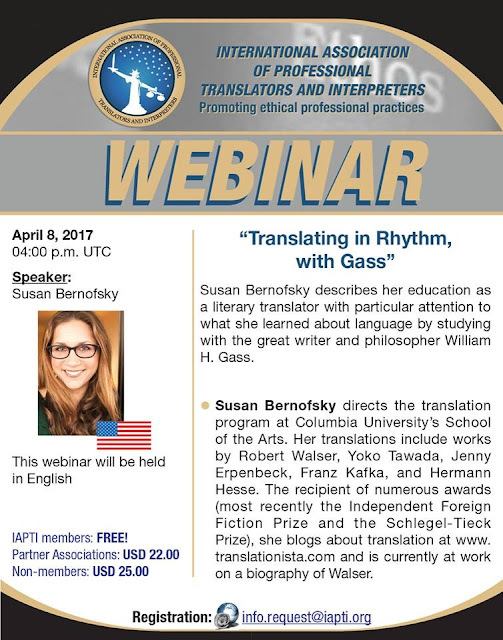 With Susan, the translation honors the original work and amplifies its best qualities. Her Metamorphosis is more readable, yet more Kafkaesque than Franz's laudable effort. Several years ago, I reviewed her terrifying translation of Gotthelf's Black Spider, which I enjoyed far more than the Swiss German original. Hers is a name worth knowing and remembering, and her work is a standard of excellence. So when I heard some weeks ago that Ms. Bernofsky would be holding a talk about her education and experiences with her mentor, William Gass, I walked around for some hours with a very big smile on my face. The burdens of workload being what they were at the time, however, I completely forgot to register until this morning. The registration page is here. If you are interested in literary translation and the philosophy behind it, why not join us for what promises to be a very interesting hour?